HAPPY EASTER to all of us who celebrate. I realized that I have been very slack on giving my blog the attention that it deserves. I think I really have too many irons in the fire. However, I'm afraid to slow down for I might not be able to get my momentum rolling again. A lot has been going on. I have been so fortunate to have such an active life. I am also blessed to enjoy the health that allows me to participate at the level I enjoy. After my family, teaching needlework is my main focus. I have been quite busy teaching, stitching models for class and writing stitch guides. What fun! Also, Shapes of Needlepoint - Series IV, Diagonals, Horizontals and Verticals, is scheduled for release mid-August so I am busy making last minute polishing touches. Today, however, I have a special surprise! 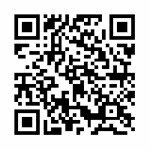 I have prepared a gift for you, my wonderful supporters, which I hope you can enjoy and use. I have created a special notebook that I have shared with various chapters over the years. 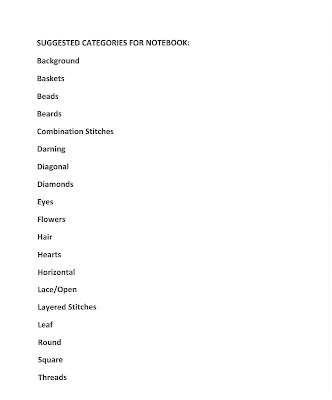 This notebook I have labeled as Stitch Samples. 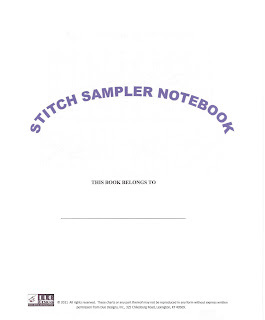 The notebook is an organized way of testing a stitch by using a free stitch diagram I will be providing you. 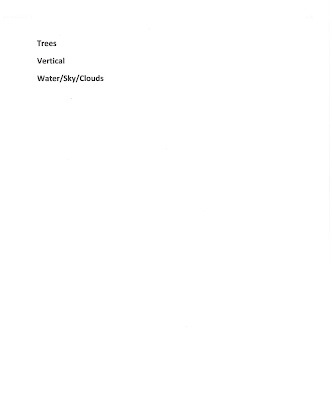 A template is provided for you as well. 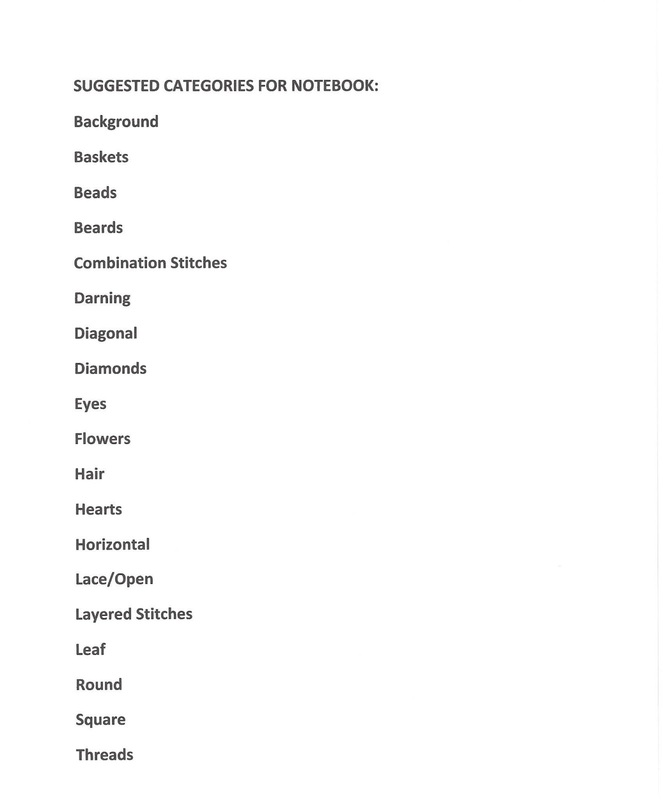 I have included pages for you to print out for your notebook. 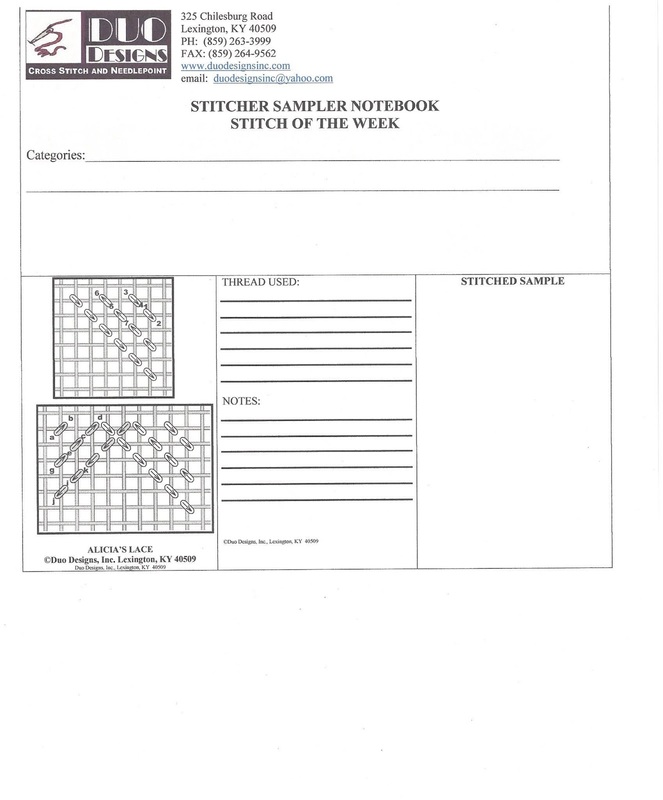 This template shows the diagram, provides a place for notes of what thread you used, etc., and had a place to mount your stitched sample. Here is a sample of what the individual pages will look like. 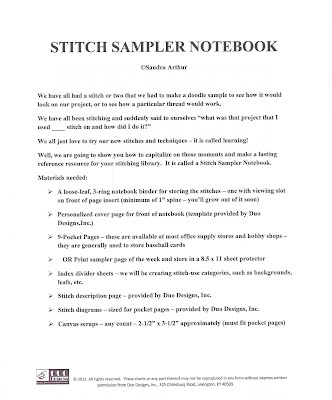 They will have the stitch name and category suggestions already typed on them and ready for you to stitch a sample and file away! 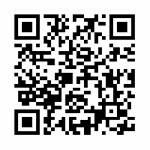 I have set up a Yahoo Group in which to download the various postings, including templates and suggestions for setting up your own personal system. Each week, I will post a new page to the group for you to download. 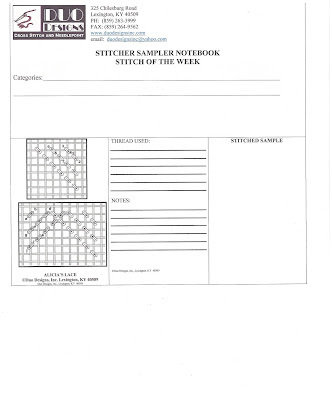 If you are interested in this adventure, go to http://groups.yahoo.com/group/webstitchsamplernotebook and ask to join the group. Feel free to remind me that I may not have posted a stitch for the week. 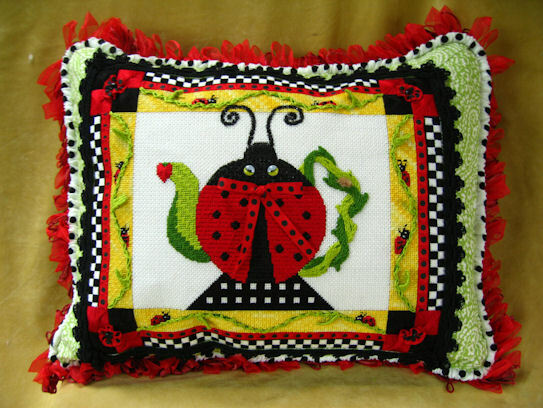 I hope to post stitches each Wednesday - I will list them as Wednesday Whimsies. I would love your feedback on the adventure. Tell your friends and let's have fun while we continue to play with one of our favorite passions. Until Wednesday, Stitch with a Smile! Great news! I have been selected to teach at ANG Seminar 2014 that is being held in Chicago. Two pieces were chosen for a total of five days of classes. The piece that is four-days in length is way too much fun! Are you ready for this? It is the sequel to To The Beach. 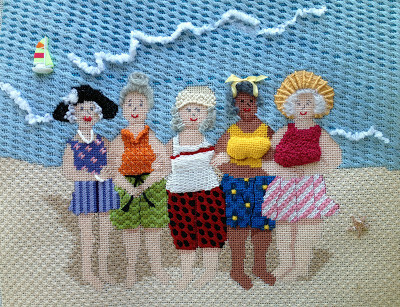 This design is Back to the Beach: The Girls Reunited. 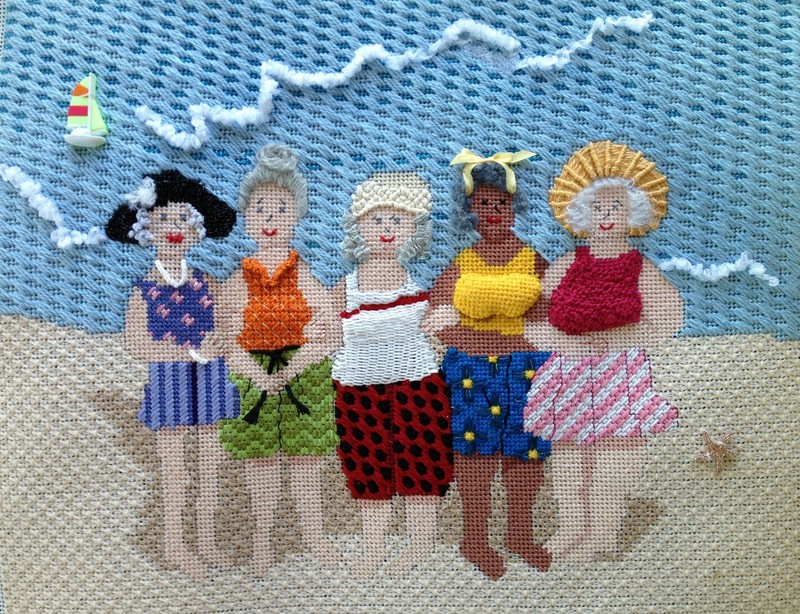 As you can see, the years have not been overly kind to our beach gals. But physical appearances have not dampened their attitudes and enjoyment of life. The next class is a one-day class that is really a workshop. It is Beading for Needlework. We'll have fun playing with different techniques and ways to enhance those ornaments and projects that are just screaming for some bling to be added. As we get closer to Seminar 2014 we will be discussing these classes further. I just wanted to tease you right now and warn you to start saving those nickels and dimes! Until next time, be sure to Stitch with a Smile! It just seems like yesterday that Anaheim Seminar was a century away. Now it is a short few months! My major class for Anaheim is my precious Pinkletoes. I just love this little girl. 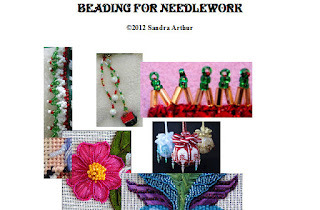 She has so much to offer in our four days together: Bargello, combination stitches, ribbon embroidery, beading, etc., etc. I am getting ready to leave for a week-long retreat. So I decided to discipline myself to at least take small spurts and work a little by drawing a few canvases in preparation for my class. This piece has 5 canvases! (plus a little Aida for the soft bunny tail). When checking my inventory, I had only 3 yards of Congress cloth in the creme/ecru/ivory/whatever color you choose to call it. Well, one yard is not enough to get the 5 pieces for Pinkletoes. It takes two yards to get two bunnies (come on now, you can figure out why that is). That certainly wasn't going to be a lot of progress if I were only going to do two bunnies - although I'll admit that would be two towards the goal. So, I go to my trusted supplier and place my order for 20 yards of this fantastic fabric. I am told, however, that there is none in stock and there is no ETA for the replacement. Now, this is a LARGE supplier who orders directly from overseas. After a brief bout of panic, I get on email, phone, fax, anything I can think of to start getting my supply of needed Congress for this class. Most of the time I'm hitting a wall. Finally, thank goodness, a supplier came through with my 20 yards and it should arrive today or Monday here at my studio. I sure must be living right or something. I have always said that the good Lord looks out for me because so many wonderful things occur in my life. This is one example of why I feel that way. So now I have no excuse for not getting a little work done during my days of play with friends (well, my daughter is in that group and she is my friend but maybe I should also say family and friends, but then that would sound like she is only included as family and not a friend - see, I can go on and on with this kind of analyzing)! My second class at Seminar is not nearly as difficult to prepare for. 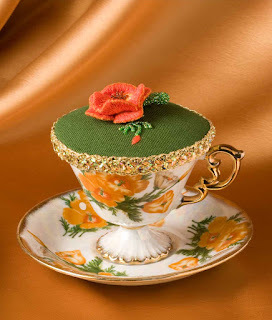 Teacup Treasures - California Poppy is the beginning of a series. I hope to create different designs for different state flowers. I have a bolt of the green and the other part requires muslin which all the fabric stores are happy to sell to me. 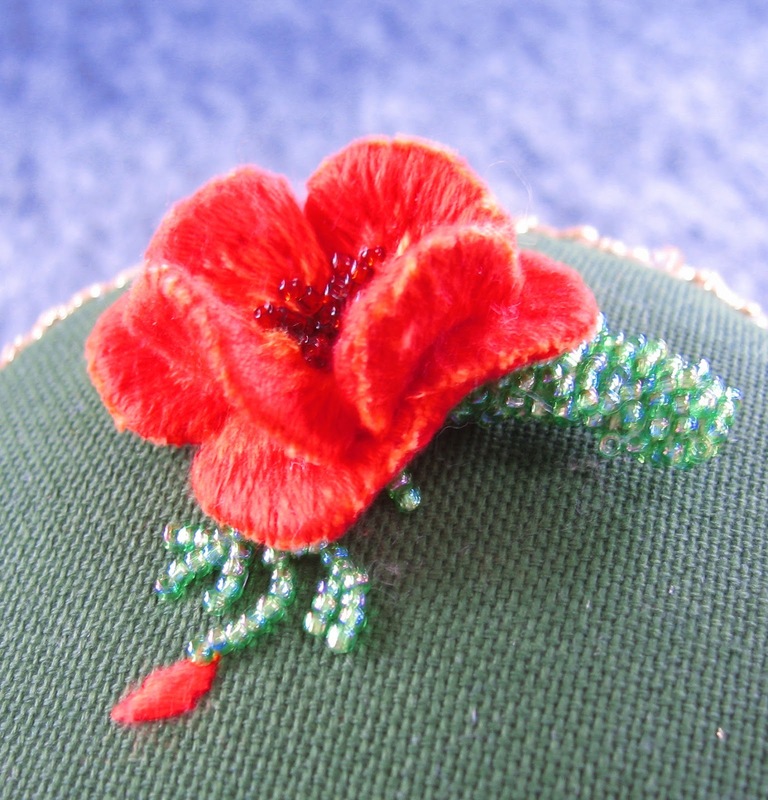 This one-day class is a relatively simple stumpwork technique that produces my version of a California Poppy. There is also some beading thrown in for good measure. 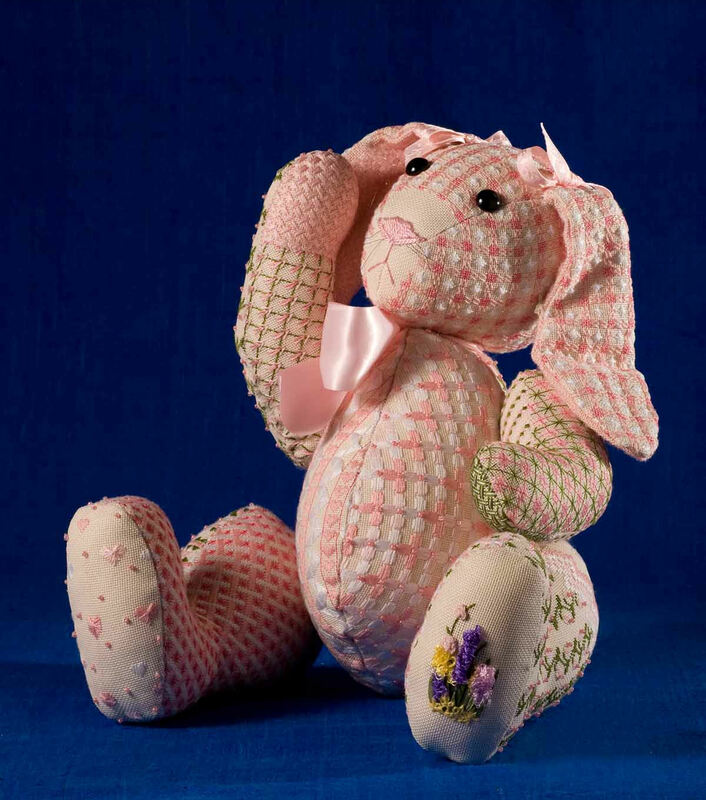 There are a few stitches that still need to be added to the model to provide a grounding for the design, but deadlines caught up with me and off she had to go. 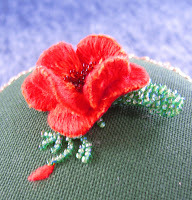 This piece is lovely as a box top or a pincushion (would anyone dare put a pin in it)? Here I have shown it in one of those teacups that we seem to must keep and not throw away or donate because it might be a reminder of someone, etc., etc. You know how it goes. So to me, this was a practical way to make good use of it. For those of you with your Seminar Brochure more complete details are on pages 11 and 33. I would love to see you in my classes at Anaheim. We will have fun! Look who has been added to the online shop of www.duodesignsinc.com. It is Delilah! This wonderful gal is a member of Leigh Designs' Femme Fatale Series. She is so much fun. Look at all the great stitches. threads and embellishments used. Rainbow Gallery, Burmilana, Caron Impressions, Kreinik, Planet Earth Silk, Sundance Sparkles, Sequins and Beads - WOW! 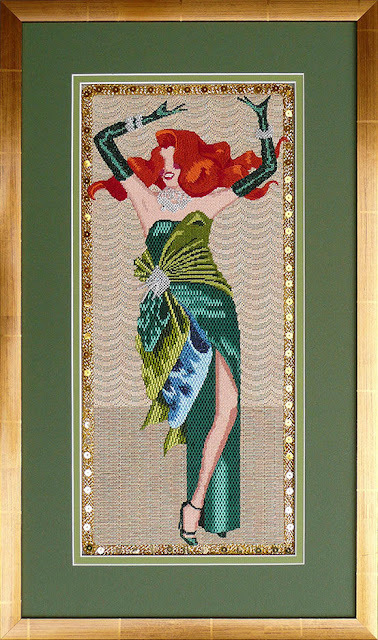 Hand-painted on 8" x 18" 18 count canvas, this design offers lost of bling and entertainment as you stitch it to its completion. The stage lights incorporate the great Sparkles with added sequins and beads. The stage curtain is stitched with burmilana. Her fantastic hair is made up of numerous shades of Impressions. The gown shimmers and shines with the help of Rainbow Gallery threads. And her bling is made possible by beautiful Sundance beads and sequins. 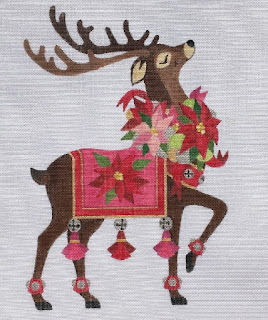 This design is offered as a painted canvas plus stitch guide or as a stitch guide only (pdf format). 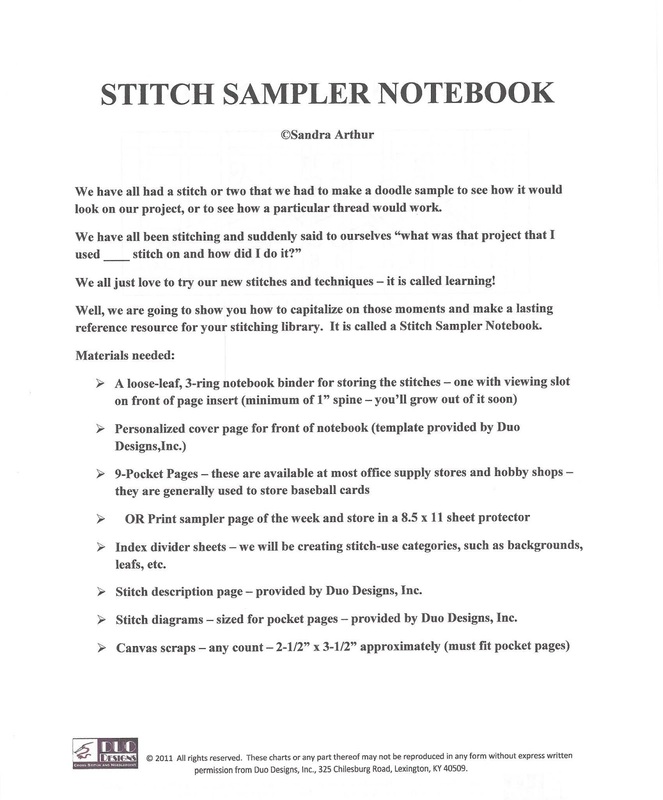 Be sure to check it out at www.duodesignsinc.com under the online shop drop down menu.